Skyline is absolutely gorgeous. Its so modern, so chic, and so luxurious! I love how much glass is in the house, because you can see the ocean from any room. The bedrooms are all super spacious and I love the open design. Not to mention, the exterior has tons of space to soak up the sun and relax. Multi-level luxury villa with exceptional views! 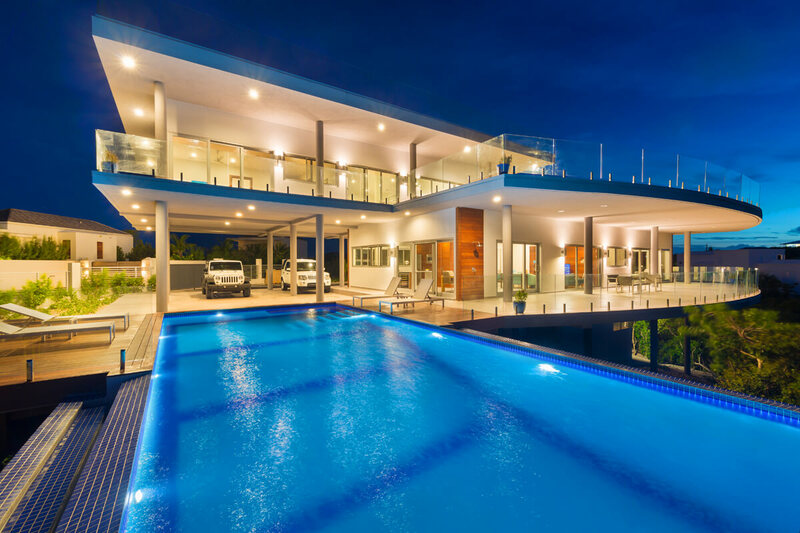 Skyline is a luxury villa with ultra-modern design, panoramic views, and easy access to Grace Bay. This North Shore property is fully gated and has air-conditioning and WiFi throughout. Skyline has over 4,000 sq. ft. of outdoor space set across four levels. The massive infinity pool sits in the center of a large wraparound deck with ocean views, and loungers and sun beds are abundant. Skyline has beach chairs, towels, and umbrellas to take down to the coast, so sunbathing by the sea is a piece of cake. A glass balcony surrounds the decks, and there’s a hot tub perfect for relaxing under the stars. The interior is even bigger, with the main living area and kitchen on the second floor. Both spaces are chic and airy, with neutral color schemes and beautiful wood accents. The living room has a sound system, a flatscreen TV with cable, and a home office. The glass-walled kitchen is fully equipped with dining for 6, a coffee machine, and stainless steel appliances. Cool tile floors run throughout, and all-white walls and ceilings add light to every space. On the third floor, there’s a small gym with ocean views and cardio equipment. Daily housekeeping ensures guests don’t have to lift a finger. All three bedrooms are spacious and contemporary, and have an ensuite bathroom, study, and a balcony with an ocean view. Two suites are located on the main floor: one has a king bed and the other has two queen beds. Both suites have their own bathrooms with a walk-in shower. The master suite is on the third floor, and includes a private lounge, a large closet, and a vanity. Its bathroom has a walk-in shower and a soaking tub. On the ground floor of the villa, there’s a separate staff quarters with its own entrance. Skyline is in the perfect location near Grace Bay, Turtle Cove Marina, and several shopping centers. Smiths Reef has the best snorkeling on the island, and is just minutes away. Five minutes to Grace Bay Beach access and Turtle Cove. Upon arrival at the airport guests are provided VIP fast track services and transferred to the villa in a private SUV. Departures transfers are also included. VIP Fast Track Airport services roundtrip, luxury SUV, complimentary bottle of wine upon arrival, and a care food package which includes bottled water, coffee, tea, bread/pasteries, eggs, milk, cereal and a fruit plate. Private chef, butler, server, grocery and beverage shopping (pre-arrival and during your stay), liquor and wine delivery, nanny service, baby equipment, spa services, yoga and personal training, and photography can be arranged for an additional fee. Luxury SUV included in villa rental!